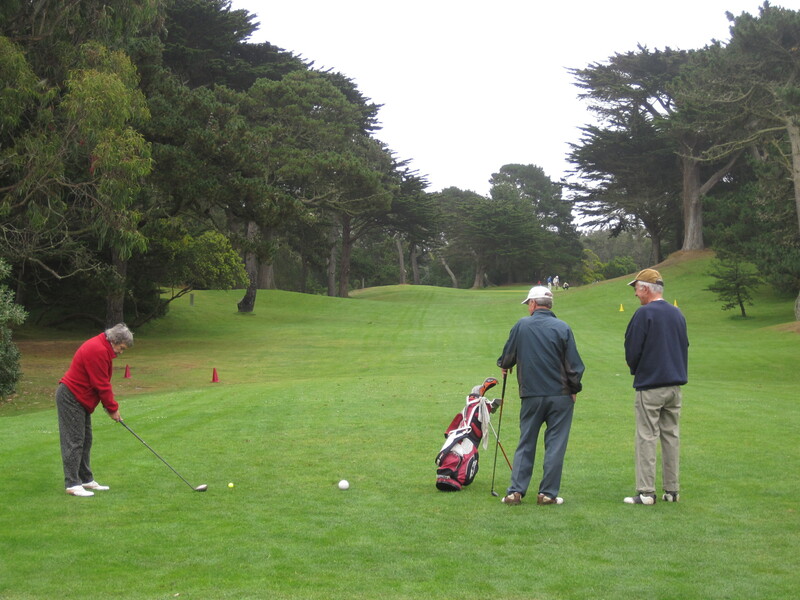 A few weeks ago Golden Gate Park was the setting for my initiation into the sport of golf. Two friends (experienced but lapsed golfers) had offered to show me how to play. Arriving at the Club House, we were met by a gentleman who seemed to be the official greeter (or maybe gatekeeper?). Identifying me immediately as a novice, he laid out the rules (either he was clairvoyant or he noticed that, unlike my friends, I didn’t have a set of clubs?). First stop, he explained, is the driving range; novices are not allowed to just head out on the course, for obvious reasons. A small basket of golf balls costs $6. Surrounded by nets on three sides, the driving range is small; hard to tell how far you are actually hitting the ball, but a good place to experiment with the various irons, learn what they are designed to do, try “teeing off” and “chipping,” get a feel for the trajectory of the ball. There’s also a putting green. Watching the ball, trying to swing smoothly and follow through . . . it felt like learning a dance move. It’s all about the angle and the form, the shift in weight from one foot to the other. Each club sends the ball on a different trajectory: high and arcing or low and far. A gaggle of little boys were enjoying hitting balls with Mom. A couple of young men arrived to warm up before heading for the course and unselfconsciously showed us all how it should be done . . . quite beautiful to watch a practiced swing, so graceful, effortless. The course itself is lush and rolling, the greens flanked by wings of Monterey Cypress, tall and scraggly. There are nine holes. Golfers headed off with rolling golf bags (on wheels). The small club house is modernist in style, very 1950s? I hear the snackbar has a reputation for some of the best barbeque (ribs) in the city? In sum, it was a great introduction to a sport that has always seemed somewhat inaccessible and pretentious to me (which is why I have never played, I guess). There were several signs welcoming beginners. The golf pro stopped by to pitch a six-lesson, introductory course offered there for $198. The first lesson must be on a Saturday; subsequent lessons can be during the week. It seems a bit of an anomaly, this golf course in Golden Gate Park; definitely not a product of the nineteenth-century mindset that produced the park originally (John MacLaren would have vehemently opposed it, I think!). Apparently originally designed as a “pitch and putt” course and added in the 1950s, this little course tucked into the north-west corner of the park seems a bit of a world unto itself. 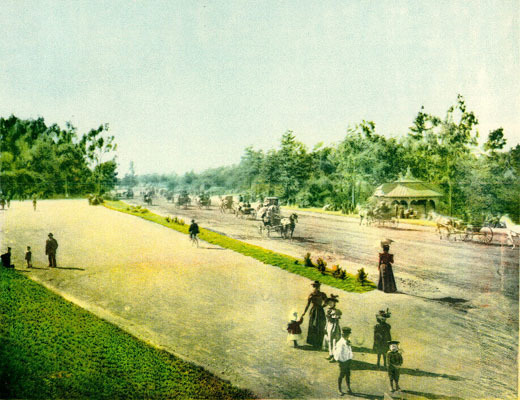 But then this park is full of enclaves like this, devoted to specific forms of recreation, each with a unique history, a special flavor, a group of devotees. Together, these enclaves make up the unique character of this park, all tied together by the strong nineteenth-century framework of meadows and forests, rolling greens and towering cypresses. This entry was posted in recreation and tagged from the thicket, golden gate park, walk in the park. Bookmark the permalink. I discovered this little golf course only a few months ago (must try the ribs sometime). Love your essay, particularly the last paragraph.